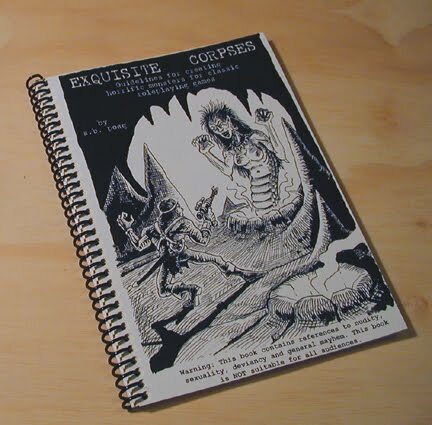 I finally got a ‘proof’ copy of my new book, Exquisite Corpses, from Lulu last Saturday. Recently I managed to prepare and proof the book and look at things I might change. This is not final art, but I placed an image from my portfolio on the cover. The final will probably have color art (we are still working on that). 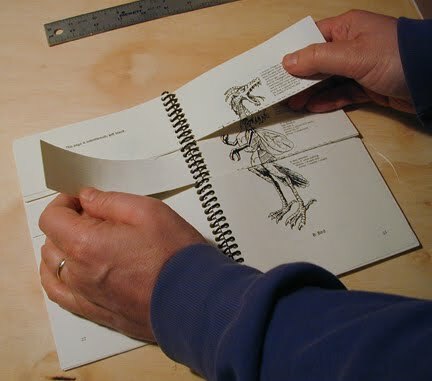 The book is a monster manual in the same vein as Raggi’s ‘Random Esoteric Monster Generator.’ Each page consists of an image that is divided into three tabs (head, torso and legs or tail). If you slit or cut each page along the dotted lines, you can mix and match the tabs to create weird and goofy ‘combination’ creatures. There are 26 basic creatures, so, by my math, that makes for ~17,000 possible combinations. In addition, there are some tables in the back that will allow you to add more qualities or flaws to your critters (bigger, smaller, laser beams, etc.). The ‘coil’ binding allows the tabs to move freely without falling out. 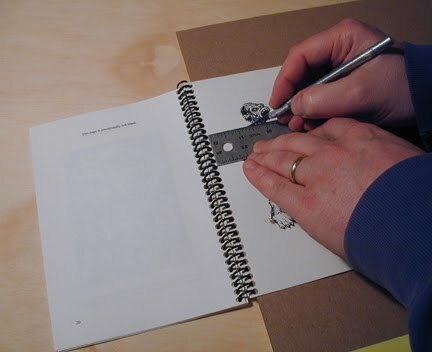 You can use a razor knife and straight edge to slip the pages into tabs. Note that I have placed a sheet of waste cardboard under the last page I want to slit so I don’t cut the pages behind it. The first proof is about 95% successful (one of the monsters failed to line up properly with the rest of the pages; I haven’t been able to figure out if that is my problem or Lulu’s). Once I get these few details ironed out and a second proof, I hope to be able to offer it via Lulu to all interested buyers. The only catch is that you have to cut the pages yourself. This is AMAZING! It reminds me of the FACETASM art book by Gary Panter and Charles Burns (google it). Can't Wait! That cover looks pretty darn cool to me. Wow, that is a really cool project. Consider me sold. I dig your art style.